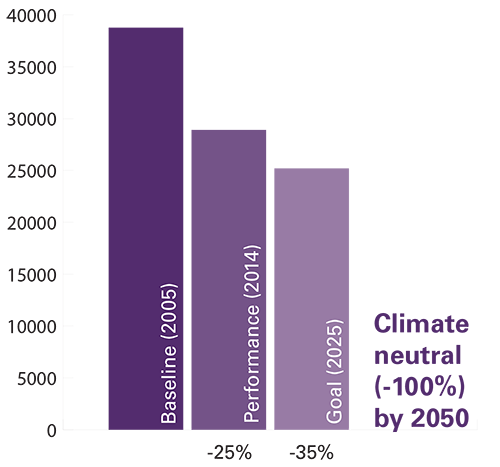 Most of the strategies in the other topic area sections are also emissions reducing strategies that will lead UNK towards climate neutrality. The strategies we describe below, however, are the ones that are less directly related to other UNK sustainability goals. The chancellor should institutionally commit UNK to climate neutrality by signing the American College and University Presidents’ Climate Commitment. As of October 2015, three of UNK’s peer institutions have signed, and over 650 institutions have signed nationally. This is also a great opportunity to increase awareness of UNK’s sustainability and climate neutrality efforts: sadly, less than 11% of survey respondents knew “a fair amount” or “a lot” about UNK’s efforts to reduce emissions (Verdis Group’s UNK Sustainability Engagement Survey, March 2015). Within the next 20 years, achieve a facilities vehicle fleet that is 100% sustainably fueled. Implement a policy or guidelines that limit the use of gas-powered lawn care equipment, especially during poor air quality days. Alternatives to gasoline include propane, compressed natural gas, electric, biofuels, and manual tools. Offset carbon by purchasing Renewable Energy Certificates that are either Green-e Energy certified or meet Green-e Energy’s technical requirements and are verified as such by a third party. Offset carbon by identifying campus land to be managed specifically for carbon sequestration and document as such in policies, land management plans, or the equivalent.